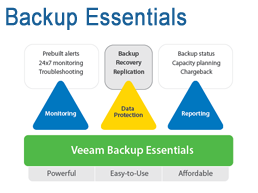 Veeam Backup & Replication™ provides fast, flexible, and reliable recovery of virtualized applications and data. 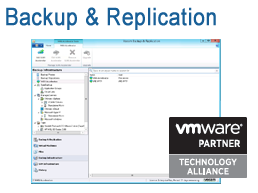 It unifies backup and replication in a single solution, increases the value of backup and reinvents data protection for VMware® vSphere and Microsoft Hyper-V virtual environments. 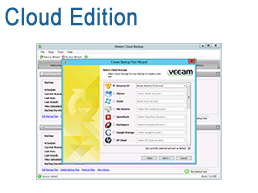 Veeam provides fast, flexible, and reliable recovery of virtualized applications and data. 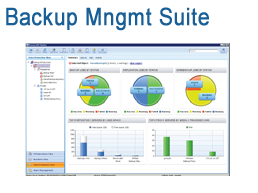 It unifies backup and replication in a single solution, increases the value of backup and reinvents data protection for VMware vSphere and Microsoft Hyper-V virtual environments. It's Veeam® Backup & Replication™ especially packaged and priced for small businesses (approx. fewer than 250 employees), with a savings of 33% or more. It provides exactly the same functionality as Veeam Backup & Replication and is available in the same licensing editions: Standard, Enterprise and Enterprise Plus, depending on the functionality. It is only available for virtual environments with 2, 4 or 6 CPU sockets. The Cloud Edition includes everything you get with Veeam Backup & Replication, but with the added capability of automatically storing your VMware and Hyper-V backups with any of over 15 public storage clouds and open cloud storage platforms. New Veeam Backup & Replication v7 is taking Modern Data Protection to the next level. "Veeam Backup & Replication is so incredibly easy to set up, use and manage, even in a large installation like ours..."
Our specialists are expert in designing data center solutions and can help you create a plan for sourcing and deploying your Veeam solution. Optrics offers personalized Veeam product training - a service designed to help you integrate your Veeam solution smoothly into your network infrastructure.